Land-use applications are a rich source of conflict, almost everywhere. That’s certainly my experience, here in Victoria. Too often, the interests of developers, public administrators and community members are in conflict, especially when a rezoning, or amendment to the Official Community Plan, is required. It’s not uncommon for changes proposed by a developer to be viewed with suspicion by community members, trust between parties to be minimal, and supporting civic process insufficient to deal with the complexity of land-use decision-making required. And, that’s even with our (Victoria) decent land-use application process, as I wrote about, here. When land-use conversations become challenging, i.e., conflicted, people tend to glob on to the negative sentiment. It’s not a fair fight for our attention. We are wired to our negativity bias. What can be done to address those challenges, build consensus among the stakeholder groups, and deescalate conflict? Poor relationship and level of trust between stakeholder groups; e.g., community and developers, especially in those cases where a pre-existing positive relationship doesn’t exist between the two – is a land-use application a stand-alone transaction or is it part of a long-term positive relationship, between all parties, before, during, and after the development? Supplement the pre-application stage of the land-use application process with a Situation Assessment. The Assessment would be conducted by a third-party neutral; e.g., impartial facilitator or mediator. 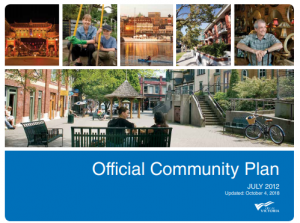 (My Mayor, Lisa Helps, has also advocated for use of a neutral) The Assessment would be convened by the City, and involves confidential interviews with each stakeholder group. (Non-attributable) stakeholder perspectives are gathered. Information is shared. A summary findings and recommendations reporting takes place. The Assessment can be tailored to match the scope and complexity of the application. The Assessment can also be used (especially on complex applications) to determine if a more comprehensive mutual gains approach is warranted. Enhance the community’s capacity to constructively negotiate. The land-use application process is a negotiation. In my view, the community needs to be better equipped for that negotiation. To level the negotiation playing field, the City should provide additional resources and/or training support for community members involved in the negotiation, of the land-use application. A stronger community negotiation team, evidenced by clear, inclusive and consistent communications, is to everyone’s benefit. 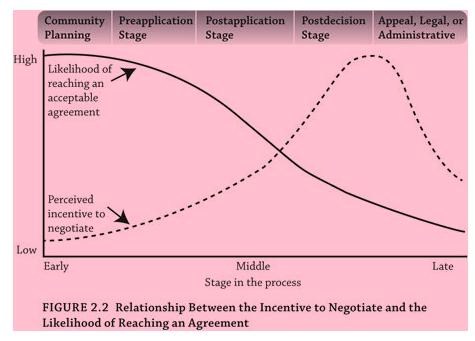 The sooner all stakeholders are incentivized and effectively equipped to negotiate, the better, as shown in this graph from, Consensus Building Institute’s book, Land in Conflict: Managing and Resolving Land-Use Disputes. Conduct education and training in the collaborative problem-solving and mutual gains approach. People can’t read minds. And, they aren’t born collaborators. Communication and collaboration, especially of the authentic variety, must be learned. And, once learned, applied, proactively. Land-use partners (e.g., City and industry association, Urban Development Institute) should work together to expand awareness and build skills capacity, at all levels. Healthier relationships and common ground solutions will follow. Positive responses to those questions will take you far, together.